Found & handling a range of FreeBSD & Linux machines infected with this trojan. Is a compiled ELF/x32 on a successful hacked machine. Compilation traced to gcc, Linux is main target, xBSD or other *NIX system supported Linux compatibility also can be affected. It was faking bash as "-bash" in process (ps) at xBSD which doesn't used that shell so it was spotted easily. 2. Locking itself in specific PID to avoid double starts/killed. 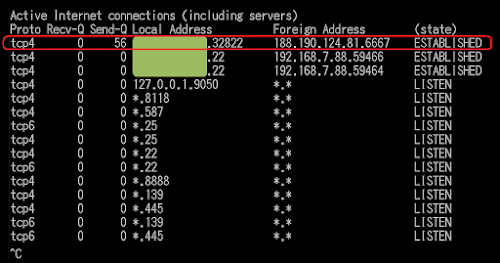 c. Custom commands like; _352, _376, _433 for botnet comm purpose. - bash // malware process..
PRIVMSG %s :Nick cannot be larger than 9 characters. PRIVMSG %s :I'm having a problem resolving my host, someone will have to SPOOFS me manually. Thank's for the info. I checked the page & chat with the owner. The fact is: we don't know for sure. do we? Yes I saw some similarities, but that "could be" another variant. yes? i.e. jarmoc.com's reported case was Linux, and no binary compiled report/hash on that. I need to see something to compare to be confirmed/sure. Is that one for sure and "that one" being a slight modification of better known "kaiten.c" aka Kaiten a Linux/Unix DDOS IRC bot. exitthematrix wrote: Is that one for sure and "that one" being a slight modification of better known "kaiten.c" aka Kaiten a Linux/Unix DDOS IRC bot. I wish I knew this fact BEFORE I reversed them - sigh - what a waste of time..
.text:0x402748 addiu   $a1, $v0, (aNoticeSPanTarg - 0x410000); <====HERE! .text:0x405360 la      $v1, aCore       # "#core"
.text:0x405370 la      $v1, aBleh       # "bleh"
So this is what the PAN attack is all about..
New samples on x32, x64, ARM and PPC!! Thank's to Malekal for the contribution. It's the version with the PAN attack (v2), case is under investigation so I can not say much. .rodata:0x04C2A6  db  2Eh ; . .rodata:0x04C2AF  db  2Eh ; . mov     ds:chan, offset aBorgir ; "#Borgir"
.mov     ds:key, offset aP06tain ; "p06tain"